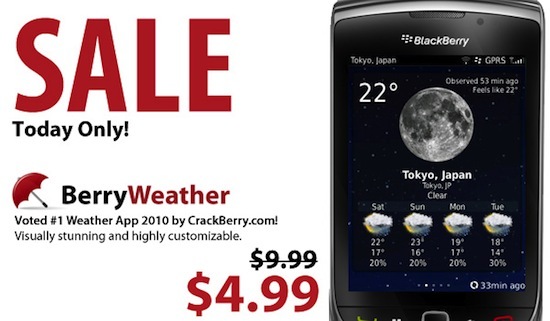 Deal of the Day: Get BerryWeather for 50% today only! BerryWeather is one of the best weather apps out there for BlackBerry. One of the Crack Team's favorites (and a CrackBerry Awards winner), it gives you a ton of features in a great app. Set multiple locations, see various forecasts, view animated radar maps, get weather advisories and even add a weather icon to your homescreen. BerryWeather keeps you in the loop and you'll always know just what the temperture is or when the rain is on its way. In the latest version you can even add custom weather icons to make BerryWeather totally cusomtized to your liking. BerryWeather sells regularly for $9.95 but today only you can grab it at 50% off for just $4.99 as part of our Deal of the Day.